Under their Productive Cities programme, the 14th edition of the Europan competition was launched in June 2017. Working within their mixed cities programme, the brief invited architects to play a central role in the creation and refurbishment of 5 (high priority for development) sites in Amsterdam. The 318 Studio team chose the Papaverdriehoek site located in the Amsterdam-Noord area of the city. A rugged former ship yard zone, this mainly working class, old industrial part of town with many spacious and commercial areas reminiscent of our own pre-regenerated East End has itself recently seen the influx of a thriving community of entrepreneurs and artists. The design team began their future re-imaginings by extensive research into the rich history of the city. Specifically they looked at the Dutch Golden Age of the 17th Century when Dutch trade, science, and art were among the most acclaimed in the world. It was a time when architecture flourished and cities began to expand. As the economy thrived there was a great upsurge in building and this was where the fashion for vertical buildings began. It was also a time when less ornamentation was used and natural stone was preferred above bricks. Through analysis of the ground plans of Amsterdam-Noord and the surrounding city the 318 Studio design team discovered historical patterns of differing and varied approaches to urban and architectural development and growth manifested through often competing urban and architectural scales and sensibilities. The result is a city grain that is haphazard, informal and open weaved. Thus identifying that the dense, tightly knit fabric of the historical city centre was more conducive with vibrant urban communities the team decided to reference the compact streetscapes and city blocks of the Jordann and Harrlemmerbuurt neighborhoods into their plans for Papaverdriehoek. At this point the architects were also studying 17th Century paintings particularly those of Pieter De Hooch. His painted representations of everyday life played out in interiors and courtyards seemed to offer a particularly Dutch sensibility of the topography of public and private realms. A model that not only fed into the team’s design narrative but also dictated the colour palette of their design sheet drawings. Hooch’s depictions resonated strongly with the project’s aspirations for layering and blending the hard boundaries between the home and the workplace. In particular, the design draws influence from De Hooch’s renderings of physical and visual thresholds that signal the transitions from private to public by use of a doorway, a passage, a wall or change in floor / ground materials. 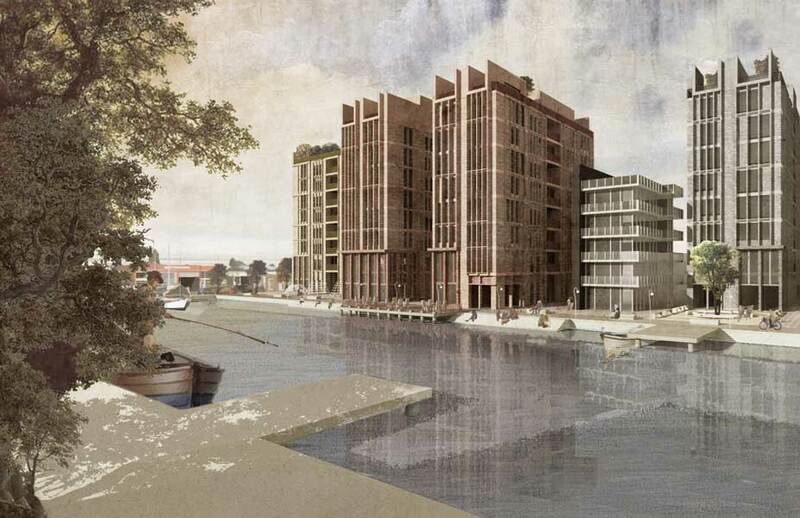 The design, employing a high vertical silhouette reminiscent of typical Dutch houses, developed into a proposal for three blocks, intended as cores to propagate a future development across the wider site. It was through these cores that they set about designing flexible and fluid spaces threaded through dense courtyard blocks which would answer the project’s central aim to provide interwoven live / work environments. The proposals allow space at every level for the possibility of informal productive workspaces and pop ups intended to encourage the collaborative collective living which would foster a true circular economy. Echoing De Hooch, outdoor rooms, courtyards and hard and soft landscaping were also incorporated within the designs. Along with fully accessible dwelling, work and retail spaces the blocks allow for public gardens, playground, café, waterside promenade and hard and soft landscaping. The generous circulation spaces aid this plasticity becoming communal gardens or growing spaces, additional workspaces on expanded balconies or simply a meeting / overspill area. This is reflected in the materials where the character of the space is lifted through rich textural finishes blurring the lines between the enclosed private spaces and the semi-public spaces outside them. Amsterdam with its long history of liberal values and innovative architectural models is a city expanding into the future. According to the Amsterdam City Council as many as 150,000 inhabitants are expected to migrate into the city between now and 2040. In order to prepare themselves for this eventuality the Amsterdam City Council developed the comprehensive new Structural Vision Amsterdam 2040 city master plan, integrating innovative urban design and neighbourhood rejuvenation strategies.